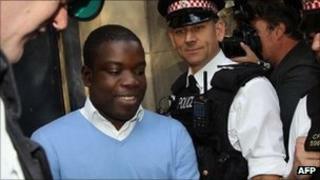 Kweku Adoboli, the UBS trader alleged to have lost UBS $2bn (£1.3bn) in unauthorised trading, has appeared in court in London charged with fraud and false accounting. He has been remanded in custody until a committal hearing on 22 September. According to the charges, the fraud took place between January and September this year. UBS is expected to provide more details of Mr Adoboli's trading by Monday morning. The charges add that Mr Adoboli filed false accounts between October 2008 and December 2009, and from January to September 2011. The 31-year-old worked for UBS's global synthetic equities division, buying and selling exchange traded funds, which track different types of stocks or commodities such as precious metals. Prosecutors say Mr Adoboli "dishonestly abused that position intending thereby to make a gain for yourself, causing losses to UBS or to expose UBS to risk of loss". BBC business editor Robert Peston reports that Mr Adoboli worked in the back office before becoming a trader, which may explain how he managed to keep his trading secret. "This revelation, that it may have been almost impossible for UBS to spot Mr Adoboli's unauthorised dealings at an early stage, is expected to reinforce political pressure in Switzerland for UBS to hive off its investment bank," our correspondent said. The Financial Services Authority (FSA), the City regulator, is investigating why the Swiss bank did not identify the trades. One banker described UBS's inability to see what Mr Adoboli was doing as quite extraordinary. City of London Police said in a statement that its "investigation is ongoing and officers continue to work in close collaboration with the FSA (Financial Services Authority), SFO (Serious Fraud Office) and CPS (Crown Prosecution Service)." Earlier, it emerged that UBS learnt of the unauthorised trades after being informed by Mr Adoboli. "The disclosure that it was Mr Adoboli's decision to inform his colleagues of his actions that set alarm bells ringing at UBS, rather than its own monitoring system, will add to concerns that investment banks simply aren't capable of controlling the huge risks that their traders take," Robert Peston said. Mr Adoboli has taken on the law firm Kingsley Napley, which also represented Nick Leeson, the rogue trader who brought down Baring's bank. According to reports he is the son a retired United Nations employee from Ghana, and that he attended school and university in Britain. The credit rating agency Moody's says it is reviewing UBS's rating, focusing on "ongoing weaknesses" in the Swiss bank's risk management. Another agency, Standard & Poor's, suggested it was considering lowering the bank's A+ rating. UBS lost £35bn in the 2007-8 banking crisis and had to be bailed out by Swiss taxpayers. Moody's said that although UBS was strong enough financially to absorb the loss, it had concerns about its risk controls. "We have continued to express concerns with regards to the ability of management to develop a robust risk culture and effective control framework," the agency said. Last month the bank announced 3,500 jobs cuts. Of the 65,000 staff worldwide about 6,000 are in the UK, with the bulk of UBS's investment banking operations based in London and New York. It has been reported that the fresh losses from the investment bank will lead to a major restructuring of the business, involving thousands more job losses, which will be announced in November. "We believe that yesterday's event could have personnel consequences on senior management level, which in turn could lead to adjustments to UBS' business portfolio," said Teresa Nielsen, an analyst at the Swiss bank Vontobel. "The exit from non-core businesses inside the investment bank could be accelerated," she added.